Virginia Tech’s Department of Science and Technology in Society hosted its second in a series of talks as part of the Seminar on Interdisciplinary Research and Education in Nuclear Emergency Response (SIREN), on 24 February 2015 at the Virginia Tech Research Center in Arlington, Virginia. SIREN, is part of a National Science Foundation (NSF) CAREER grant and aims to bring together nuclear experts to share perspectives on the response to nuclear emergencies. The speaker, Mr. Kenji Tateiwa, is Tokyo Electric Power Company’s (TEPCO) manager of nuclear power programs at TEPCO’s Washington, D.C. office. The subtitle of the talk, “A TEPCO Nuclear Engineer’s Perspective,” evokes images of reactor buildings with blue hued reactor fuel pools, and faceless, white hooded and booted figures intently attending to seemingly incomprehensible technology. The anonymizing protective suits symbolize nuclear power and give the operators a mysterious air of unapproachable expertise. It is an image of scientific and engineering achievement, and modern progress. Tateiwa’s talk did not shy away from the intricacies of nuclear technology at Fukushima Daiichi and he described in detail many of the key functional aspects of the reactor systems and what had been destroyed by the tsunami. He, perhaps surprisingly from an engineer’s perspective, turned his story from a focus on the physical reactors themselves and toward the humanity, masked by those suits, of a sociotechnical system that disastrously failed. Tateiwa’s story made visible the very human actors who struggled to respond to Fukushima Daiichi’s destruction. Tateiwa tells that 11 March 2011 was a day of normal operations for the nuclear engineers at Fukushima Daiichi. All personnel were working as part of an extremely rational system of functional operations, system monitoring, and maintenance of the nuclear power plant with its multiple reactors. When the 9.0 magnitude Great East Japan Earthquake struck in the afternoon, the reactors, as designed, automatically shutdown and the operators immediately shifted from normal to planned and exercised emergency procedures. Like normal operational procedures these emergency activities are explicit in detail and execution but, as Tateiwa emphasized, focus on three overriding safety principles: 1) shutdown of the reactor to stop the fission process, 2) cooling of reactor fuel after shutdown and, 3) containment of possible radioactive release. Even after enduring the largest earthquake ever felt in Japan, the TEPCO operators methodically followed their procedures to ensure the reactors had properly and safely shutdown, cooling was functioning, and that there was not a radioactive release. They soon realized that external power had been cut by the earthquake and they were controlling the plant on battery power and needed to start emergency diesel generators. Power was critical for the operation of pumps that circulated water for cooling of the reactor and spent fuel storage pools; without cooling the fuel would eventually heat itself to melting. At this point, the response to the emergency was “proceeding as planned.” The emergency generators were providing power, operators were assessing safety and stability of the power plant systems and technicians were performing inspections all according to known and practiced procedures. After one of the largest recorded earthquakes in history procedure based activities were being carried out according to a rational plan by well trained people. But less than one hour after the quake everything changed. At approximately 15:40 a tsunami, estimated at over 13 meters in height, inundated the Fukushima Daiichi power plant. The flood of water destroyed much of the plant infrastructure and killed two technicians who had been checking system status after the earthquake. Most critical to the safe operation of the power plant was the loss of emergency power; the tsunami had destroyed the emergency generators. Tateiwa presented a detailed technical diagram of the power plant that showed the locations where equipment was destroyed and AC/DC power was lost to pumps, valves, cooling spray devices and the instrumentation and control panels used by operators to run the nuclear reactors. This condition is known as a “station blackout” where both normal and emergency power is unavailable and it plunged the operators into literal darkness and rendered them powerless in controlling the nuclear plant. The TEPCO operators had not only been inundated by a gigantic tsunami of seawater that devastated the power plant’s physical infrastructure but they also suddenly found themselves submersed in an environment of the unknown where most if not all of their previous knowledge no longer applied. Their complex set of once rational, nuclear system technical processes and procedures were virtually useless. In this setting of devastation, Tateiwa described how the Fukushima operators were forced to “on the fly” begin learning how to improvise methods to monitor and control what was once a nuclear power plant, but was now a scene of disaster that had little resemblance to their previously known and understood sociotechincal system. The earthquake and tsunami had destroyed buildings and equipment and also devastated access roads and had strewn tsunami debris that hindered or utterly blocked recovery movements. Furthermore, as cooling attempts initially failed, nuclear cores melted and caused massive hydrogen explosions and increased radiation levels. These unimaginably dangerous conditions were all the more difficult to endure due to continual earthquake aftershocks, further tsunami alerts, and lack of food, water, and sleep. Nonetheless, the TEPCO operators devised methods to keep cooling water on reactor fuel through the improvised use of fire trucks and concrete pumping vehicles. They also regained some semblance of control and monitoring of the nuclear reactor system by wiring in common car batteries to power system instrumentation and control panels. None of these extremely innovative actions and responses had ever been a part of the operators’ training or, for that matter, their overall thinking; the events of 11 March 2011 were beyond what was comprehended as possible. DM: You described incredible feats of improvisation that the nuclear operators at Fukushima Daiichi and Daini used in attempts to regain control: the wiring of car batteries, the amazing 9km of cable that had to be run, using fire engines and the concrete pumping trucks to get cooling water. You called it “FLEX on the fly.” You also spoke of looking at more systematic ways to train operators to “cope with the unexpected” I think is how you put it. Can you talk a little more about what kind of training you think might increase the odds that nuclear operators could think beyond the documented procedures, which they obviously had to do at Daiichi and Daini, and to think on the fly? KT: Two areas come to mind. One is to conduct case studies based on what really happened at Fukushima Daiichi, Fukushima Daini, and other plants as well like Onagawa, and Tokai Daini during the Great East Japan Earthquake. What they did, what was successful and what was not successful. And also other operating experiences around the world. Actually, yesterday, at the RIC [the U.S. Nuclear Regulatory Commission’s Regulatory Information Conference], there was a session talking about training based on extreme conditions and operating experience and what went wrong and what went well. So, educating and training operators and first responders, based on such real life experience, will equip them with arrows in their quiver. The kind of thinking or ideas they could use based on past examples. So that’s one area. The other is that past examples may not be sufficient to cope with something unexpected so that is difficult, but maybe training them on simulators or exercises and putting them into a situation where they have to come up with creative ideas on the fly based on various scenarios. I think that would train them with the thought processes for how to frame the issue and how to make the best use of their knowledge from the past and, if necessary, come up with new creative ideas. I think those are the two: education and training. Learning from the past and then training that forces them to come up with creative ideas. Tateiwa’s description of technical innovation and methods to develop operators’ abilities to generate creative ideas during extreme failures was only part of his story. He made it clear that the people and their innovations were located in a deadly and ever changing environment that encompassed both the natural and the technical. Early in the disaster the threat of further tsunami was real and earthquake aftershocks were ever present. These natural perils disrupted physical recovery actions and hindered the ability of people to most effectively think and plan. In addition to the dangers of direct radiation exposure and hydrogen explosions, the power plant’s ruined infrastructure posed innumerable physical hazards from unstable and falling debris to open manholes that had been uncovered by the tsunami. Also, Tateiwa reminded us that the plant operators lived in the area of the power plant with their families who were also directly affected by the disaster. 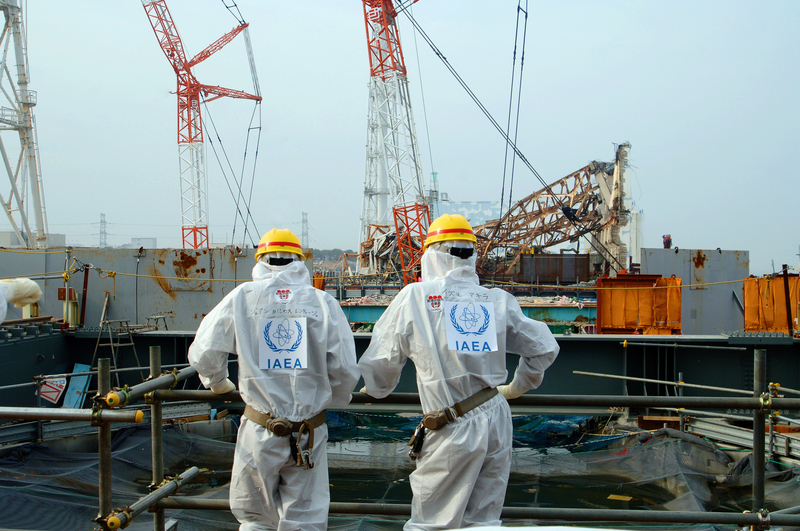 The operators had to concentrate their mental and physical efforts to respond to an unprecedented nuclear disaster while, at the same time, not knowing the fate of their families. The operators’ response to the disaster, in this impossibly complex and hazardous environment, required more than technical expertise and creativity under duress. Throughout his talk Tateiwa did not let the story move far from this human aspect of technological failure and to those who made it their responsibility to respond. While creative improvisation was needed to rapidly create solutions to extremely difficult problems the actual implementation of those solutions required something much more. The harsh and unforgiving conditions, especially the radiation, presented the Fukushima Daiichi operators with life threatening situations that necessitated decisions that put their personal commitment to the ultimate test. It was soon realized that the reactor containment structure had to be vented to avoid catastrophic failure. Due to the complete loss of electrical power the venting valves, located in areas of high radiation near a damaged reactor core, could not be remotely opened. The Fukushima Daiichi operators formed three, two man “last resort teams” who would enter the area through an airlock and manually open the valves. Even with full protective suits and oxygen packs the “last resort team” operators could very likely receive fatal doses of radiation. The first team to attempt a manual valve opening was successful, but a subsequent team was unsuccessful and had to retreat due to extremely high levels of radiation. The second valve was eventually opened remotely through an improvised method of operation. It is notable that the solution of last resort involved not merely a “safe” use of technology, but the direct involvement of human beings with possible fatal consequences. The operators were determined not to fail. DM: The most gripping part of your talk was about the conditions that the operators had to work under as they tried to regain control and to prevent further destruction of the plant. Also, your story of Yoshida-san and the “last resort teams” was unforgettable. These were senior technical experts who had to rapidly observe and assess the situation and make decisions that could very well cost their lives for something that might not even succeed. Now, that’s a very human and really a very heroic story. Can you train for that? Are nuclear plant operators similar to police and firefighters or even the military? Does that thinking have to be part of the culture of the nuclear community? Is it more than just a technical job? KT: I think, to some extent, working at a nuclear power plant, people will need to think about their occupation as somewhat similar to that of firefighters. However, the most important thing is not having to let anyone take actions that may claim their lives. So that’s from the design point of view and the accident management point of view. The first thing is to prevent such things from happening. But if it were to happen, in order to train people to take necessary actions, one is from a technical point of view where the responders understand, technically, to accurately grasp the conditions and understand the procedures that need to be selected and implemented, but at the same time they must have the willingness to take certain risks in implementing those actions. In the case of Fukushima Daiichi and Fukushima Daini one of the many things that played a big role was the fact that many of the operators and first responders were local residents from Fukushima. So it was a sense of having to save their home town and their neighbors and their families. So that sense of mission was a big motivator for them to stay behind. So I guess it’s important to nurture that sense of ownership not only about the plant, but the local community and the responsibility to the local community and the local residents. I think that’s very important to be a responsible operator. Although Kenji Tateiwa is a career nuclear professional and, as was obvious from his presentation, a loyal and committed employee of TEPCO, he did not tell a tale laden with excuses for the accident at Fukushima Daiichi. He told a story about people and how they responded with true heroism to the catastrophic failure of an advanced sociotechnical system while simultaneously combating a tragic natural disaster. The Fukushima Daiichi nuclear operators reconstructed the system “on the fly” by not only improvising the design and implementation of complex infrastructure, but through the creative construction of new knowledge for a system and conditions that did not exist before the accident. Tateiwa candidly told the audience that “the nuclear industry needs to be prepared for the unexpected,” which should mean being equipped to respond to unknown unknowns. He further emphasized, with noticeable sincerity in his voice, how he and his TEPCO colleagues were truly committed to nuclear safety reform and sharing of lessons learned with the global community. This type of SIREN conversation can help to prompt the nuclear community to look toward developing the kind of innovative creativity needed for international emergency response to these unknowns.